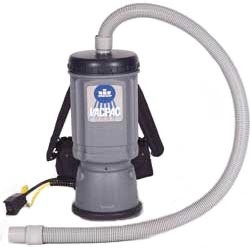 The WINDSOR VAC PAC is an electric back pack vacuum. It has a comfortable, lightweight harness system that makes the job easier. The low sound level allows for cleaning flexibility. The WINDSOR VAC PAC has a molded polyethylene housing for durability. The power switch is conveniently located on the hip within easy reach and view for the operator.